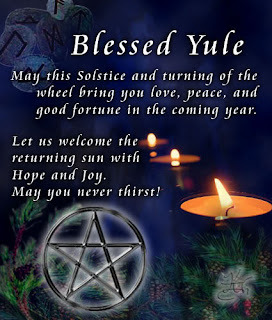 My wish for all of you this Yule season and through the coming year is summed up in that statement. I had the opportunity to view the eclipse last night and I must say it was beautiful and spectacular. A few clouds rolled in and I thought it would spoil it but they passed over and didn't move back in until the Moon was in full eclipse. The energy from the Moon was very strong and empowering. 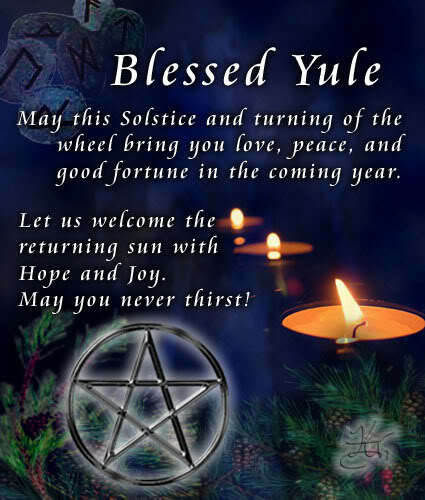 Warm wishes on this Winter Solstice and the Brightest of Yule Blessings upon you all. I'm still around, I just haven't felt much like posting. Well I've wanted to, but I felt like it wasn't worth the effort, that it was meaningless, sometimes I felt like it made no sense. I just can't seem to focus, I'm feeling down, and wish I was anywhere but where I am right now. I want to study, but I don't know what direction to take. I don't have the recommended books and can't get them from my library. And then, I feel so weighted down with all that holy roller christianity stuff that has been drummed into me, it's hard to break free of the mentality that one will burn in hell for not following the church's prescribed methods. I know that organized religion isn't for me. But the 'brainwashing' they impose doesn't shed easily. I've been feeling down...missing my grandma and my dad. They both passed on the holidays, grandma Thanksgiving 2006 and my dad Christmas Eve 1994. I know they wouldn't want me to be sad, but it's hard not to be. Especially when you would rather be somewhere else, with someone else. My only hope is that this time next year, I will be in a better place. Hopefully after the holidays pass, I can get back to some sort of normal posting and back to my bunny trails as I seek the Goddess.